Need to know when your process is running at high temperatures, but can’t be tied to your desk all day (or night)? Have a regular report you need to email to managers each Monday with summary data from the previous week? Want to receive a text message on your cell phone with data from your OPC servers whenever the production line goes down? Now you can all do of these, using the Email/SMS feature of the Cogent DataHub. A point and click interface lets you construct the message and embed values from any point in the DataHub, so that each message you send out has the latest data from the field. Messages can be sent based on trigger conditions, specific times of day or at regular intervals. You can design end-of-day reports that are delivered to managers’ email accounts each morning. Read more about Email/SMS Notification. 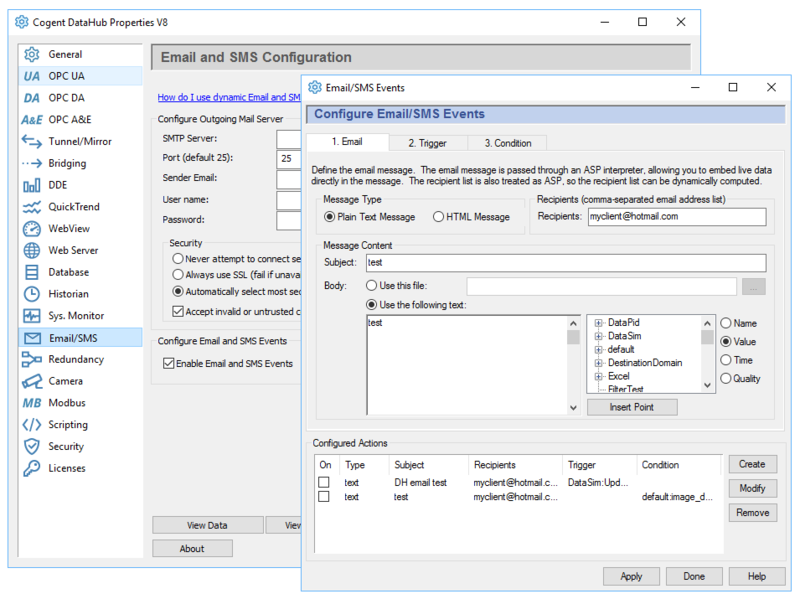 The Email/SMS feature can be added to any license pack.